Wreck Age is a post-collapse 28mm skirmish game and narrative RPG set 500 years in the future; hundreds of years after a total societal collapse. We are now in the midst of The Resurgence, where pockets of society are just beginning to re-establish themselves. We are here to ask for your support to bring a long-term dream of ours to reality: vehicles! We're proud to launch this Kickstarter campaign for our multi-part resin and metal scale vehicle models. Each kit will be easy to assemble, convert, and paint. They'll be hugely customizable, and you can swap out most of the parts from kit to kit (and keep in mind our cool stretch goal add-ons!) We're doing some neat stretch goals and have a bunch of cool add-ons too. This will give you a huge variety of style and appearance for our multi-part resin and metal vehicles. 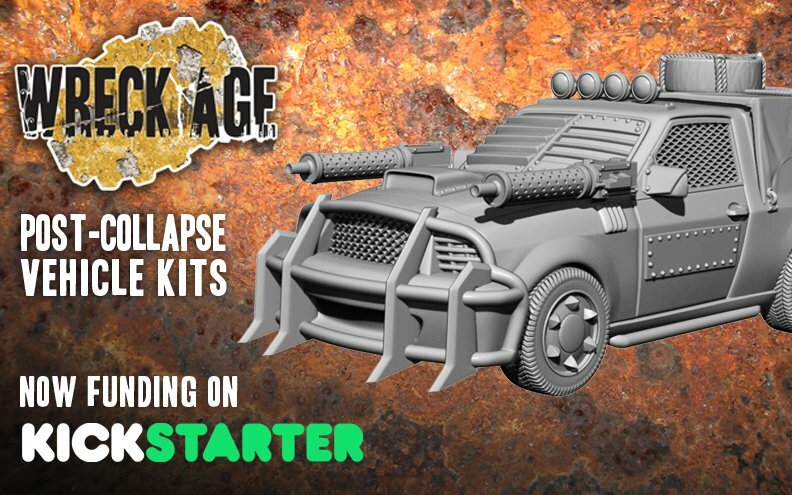 Before unlocking our awesome stretch goals, we're starting with 3 post-collapse car chassis. From there we have lots of cool stuff to unlock, including a truck chassis, motorcycles, ATV, horse riders, and buggies. With your help, we'll reach all of those goals and more! Anyhow, hello from the states and we appreciate your consideration. Vroom. And we have funded! Let's unlock some stretch goals freebies, thanks for your support everyone!